City Hall is a historic building with fine architectural detail. The interior is beautiful and has several locations that are terrific for a wedding or other special occasion photographs. 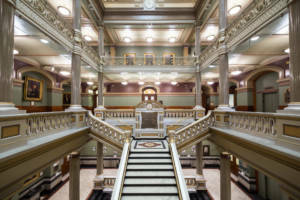 The Aldermen Chambers and the main marble staircase are popular locations. 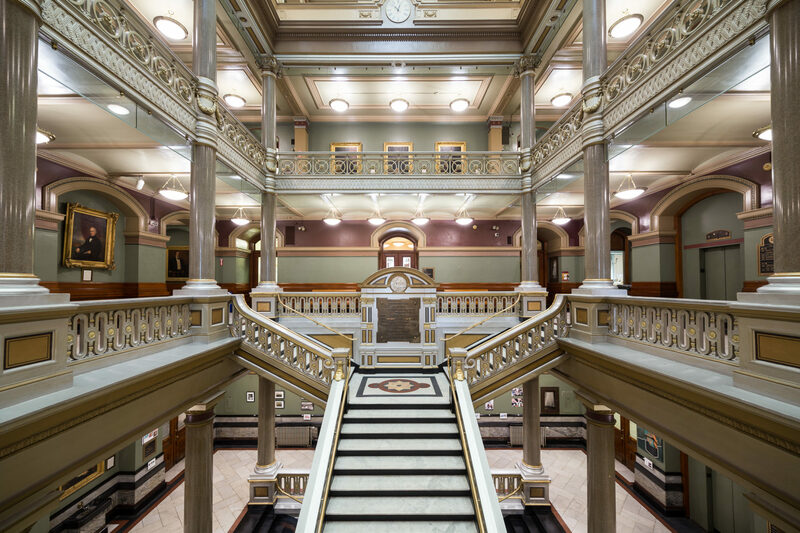 Although City Hall is a public building, a fee of $100 is required to reserve and use the building on a Saturday or Sunday for 4 hours; this is to cover the expense of having a custodian on hand and to unlock and lock the building. You may mail the check to Public Property or hand-deliver it to room 407 in City Hall. To reserve City Hall for wedding photos only “in case of rain” your check will hold the reservation. If you decide not to keep your reservation, you need to notify our office by the Thursday prior, and your check will be returned. If you would like to have your Wedding Ceremony at City Hall, small groups (of up to 40 max) can be accommodated in the Aldermen Chambers. The fee is $100 for 4 hours. We have chairs that can be set up, but you (or your appointed event staff) would be responsible for any decorating and removal of the decorations. Nothing can be used to attach items to chamber walls, furniture, or fixtures. Adhesives, nails, push-pins, and tacks are prohibited. Confetti, glitter, small beads, silly string or any other small item that will be difficult to clean-up is not allowed. Candles and open flames are also prohibited. Insurance covering damages of at least $1,000,000.00 must be provided. If your event will already carry insurance and the overall value of the certificate exceeds our minimum, we only need to be provided with a copy of City Hall named as an additionally insured party. You will be required to sign a waiver with the Department of Public Property. After you complete the form below or speak to the Public Property department about your inquiry, this will be sent to you for completion. *Your certificate will not need to include “Host alcohol coverage” as alcoholic beverages are not permitted at City Hall. You will also not need a Waiver of Subrogation. City Hall is open Monday through Friday 8:30-4:30. Stop by anytime during regular office hours if you would like to see the building’s interior. Also, feel free to stop in at room 407 (Department of Public Property) for assistance and with any questions.